Dr Brandt is excited to offer a full line of CBD Clinic topical pain relieving creams! 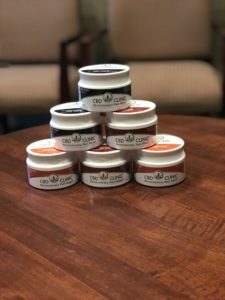 These creams use the pain relieving and anti-inflammatory properties of CBD to bring powerful pain relief right to the source of your pain! CBD Clinic is great for many painful conditions including back and neck pain, arthritis, muscle spasm/pain, neuropathy, fibromyalgia, and many others. CBD Clinic has no THC in it and is therefore available to everyone with no need for a medical card or a trip to a dispensary. You can even add CBD oil to your massage here in the office for just $15, bringing your massage to the next level! Click this link http://cbdclinic.co/ for even more information on this amazing new product and find out how it can work for you. Give us a call or come on in and Dr Brandt would be happy to answer any questions you might have!